﻿﻿﻿﻿﻿JET STYLE LUXURY AT GA PRICES! Take Flight Aviation have launched a brand new aircraft fractional ownership scheme. 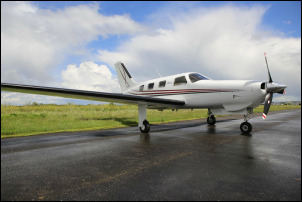 With over ten years experience in aircraft management operating over fiftenn aircraft at our Wellesbourne base in Warwickshire, we are now proud to add a fractional ownership division to our operation, offering a superb Piper Matrix, 350 horse power twin turbo, complete with the latest Garmin 650 coms, TCAS, weather guidance storm scope and Avidyne 9 package. With annual hourly packages available with 35, 50 or 75 hours exclusive use hours use for the stakeholders, the scheme offers Jet Style Luxury at General Aviation prices. With hourly dry rates from as low as £199 plus VAT you too can be living the dream! From the minute you climb the air stair door you sense the aircraft is larger and more substantial than traditional General Aviation aircraft. With the most expansive interior of any six place piston aircraft your passengers will have room to stretch out in air conditioned club class seating. When you settle in to the cockpit of the PA-46 you feel like you're in a much bigger aircraft in fact it's more like a jet. Our commercial pilots at Take Flight who fly corporate jets and commercial airliners can't believe the fit out. The great news is you can fly on a standard SEP PPL with as little as five hours training. 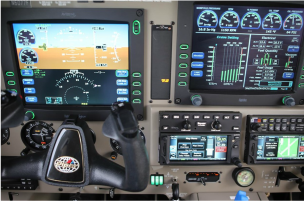 The cabin class interior is more like you would find in a private jet than a piston aircraft with reclining seats, retractable table and workstation power whilst the amazing avionics package and auto pilot up-front is a pilots dream. With a sensible cruise speed of around 190mph, maximum around 240mph and a maximum range of over 1300nm with 45 minute reserve, you and your family or business colleagues can enjoy Jet comfort at a fraction of the cost! ​When the RAF Red Arrows pop buy for a look it surely it's time to call to arrange your private viewing and request more details. . .